Can we please talk about Quetta? Why must Quetta bury its people again and again and again, while we go on as if nothing has changed? Can we talk about Quetta? They called Quetta the fruit garden of Pakistan, once. You read about it in your social studies class as the ninth-largest city in Pakistan; it was a capital, and capitals are revered. But no one ever talked about Quetta outside of textbooks. Monday night, October 24, 2016, cadets at a police training academy in Quetta awoke to a terrorist attack that killed 61, and injured more than 120. The dead bodies piled up, young men in the prime of their youth, young men that fall in the same age bracket as our brothers and sons, our husbands and fiancés, our friends and loved ones. The dead bodies piled up – and we didn’t pause. Our lives went on, the way our lives have always gone on as Quetta bleeds. Our newsfeeds didn’t go very black, our conversations didn’t change so much, and our plans weren’t disrupted at all. The dead piled up in Quetta – young men who were training to protect others, their bodies shrouded in multi-coloured blankets, a pair of naked feet poking out from underneath the fabric here, a hint of garment visible there; young men who were training to protect others lying still and cold on the ground outside a hospital, oblivious to the stares of those around them – and our lives went on. When terrorists struck the APS school in Peshawar, we came together. We came together from Karachi to Delhi, from London to New York, because the suffering of children knows no boundaries. Because killing the young is like a sudden knife tearing open the heart of the world. Now the dead bodies of young adults pile up in Quetta, men the age of our brothers and sons and lovers and friends, and we go on with our lives like nothing has changed. In August, an entire generation of lawyers was killed in Quetta – every single senior practicing lawyer and barrister died in a terrorist attack at a hospital, on August 8, 2016. And we went on with our lives as if it wasn’t our problem, not so much, not really. Those of us who have buried a loved one know how traumatic it is to lose a life. 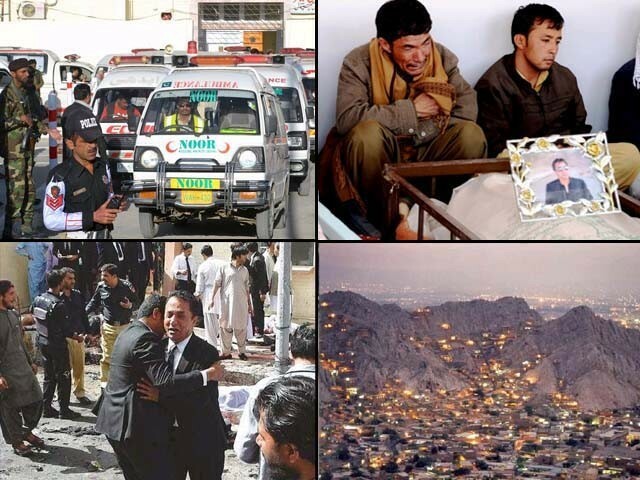 Why must Quetta bury its people again and again and again, while we go on as if nothing has changed? Why must Balochistan? In Quetta, the courtrooms lie empty because an entire generation of lawyers is gone. The loss of institutional knowledge and expertise resulting from their absence is so immense, it is almost impossible to wrap one’s head around the breadth and depth of it. Lawyers and law-enforcement agents – in the past few months, it is those that stand up for your rights that have been targeted. Without these people, who protects you? Without these people, where do you stand? What drives this apathy? What drives our inability to realise the magnitude of these horrors? What drives our continued silence on Quetta? On Balochistan? Will we never talk about Quetta outside of textbooks? Will we never talk about Balochistan? Can we talk about Dera Bugti, which houses four major gas fields, but is itself deprived of gas? Can we talk about Sui, whose people are shivering in the cold, despite providing natural gas to the entire country? Can we talk about Alamdar Road, where Hazara families sat in the open air alongside the decaying bodies of their children and siblings, their parents and partners, unable to lower their loved ones into the ground, forced to suffer the brutality of displaying their dead to the world, in the hopes of media coverage of their plight? Can we talk about Monday night, when 61 young cadets training to be protectors, lost their lives to a terrorist attack? Can we please talk about Quetta? Can we please talk about Balochistan? Flag-covered coffins and martyrdom will not stem the flow of blood, will not make up for the loss of assets that have a chance at making us whole again. Only action will, and action stems from advocacy. Action stems from knowing. Most of us don’t know anything about the situation in Balochistan beyond a vague idea of civil unrest and neglect, and it’s time we educate ourselves. The author is starting the conversation on topics that matter - mental health, domestic violence, and systematic oppression, to name a few. I just can’t believe thag the popular news channels are not even discussing about the unfortunate incident. All the coverage is given to the politicians and their non-serious and not-so-important juggalbandis. The attitude of the politicians is even more tragic. They arent even discussing the issue and are i dulged in their own problems. Why have we become so heartless that we dont even discuss or talk about the tragedy anymore. I feel terrible after watching the news channels and politicians spending hours and hours on the coverage irrelevant topics and not giving this incident due attention.